Nothing like leaving the city lights behind and heading to a rural camp ground to check up on our galaxy. Every summer the galaxy presents itself across the sky in the norther hemisphere, an ideal time to enjoy the view and spot a few open cluster along the way. After yesterday’s photo with the smart phone, I decided to go for a more professional shot and grabbed the Canon 80D and capture once again the Moon and Jupiter through the clouds. However this time around took two exposures, and stitched the together. The wide-angle was 24mm F4.0 1/10s ISO-1600. This was to pick up the clouds against a night sky as well as Jupiter. Then a close-up of the Moon, with a shorter exposure and lowered ISO to pick up details of the lunar surface (85mm F5.6 1/250s ISO-200). Opened them both in GIMP and played with layers, masks and curves to get the desired image. The close-up Moon photo was scaled down to match the 24mm wide-angle photo to avoid having gigantic moon. To get a nice view of the Milky Way I would need to get far away from the city lights and a short focal, wide-angle lens. Also most new DSLR are quite impressive in low light conditions to suppress noise at ISO settings above 1600. My old Canon XTi (450D) is best kept at 400… but when stacking many frames I can go up to 800 as the noise gets reduced in the process. Hence when planning of astro-photo session, you need to balance the level of noise and the number of frames you’ll stack. Also ensure that the light pollution or background brightness level never exceeds 3/4 of your intensity level else you are clipping and loosing information. The image below is two processed images taken with a 50mm lens on two different days (30 seconds exposure at ISO 800) stitched together the old fashion way: manually in a photo editor. Click on the above image for a a larger version and try to find the planetary nebula Messier 27. Hint: it’s blue. Continuing my wide field photography of the Milky Way I centered on the constellation Vulpecula (little fox) located in the middle of the Summer Triangle. 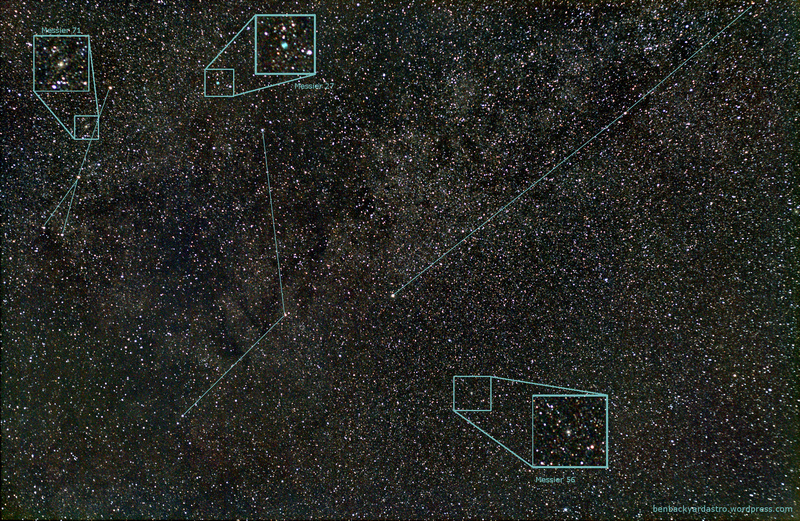 In the same frame, three Messier objects are identified: globular cluster M56 and M71; planetary nebula M27. Interesting fact is star HD189733 (second bright star above M27 in the framed portion) is the nearest extra-solar planet (63 light years) where the presence of water was detected. But at 700degC, chances for life are pretty slim. 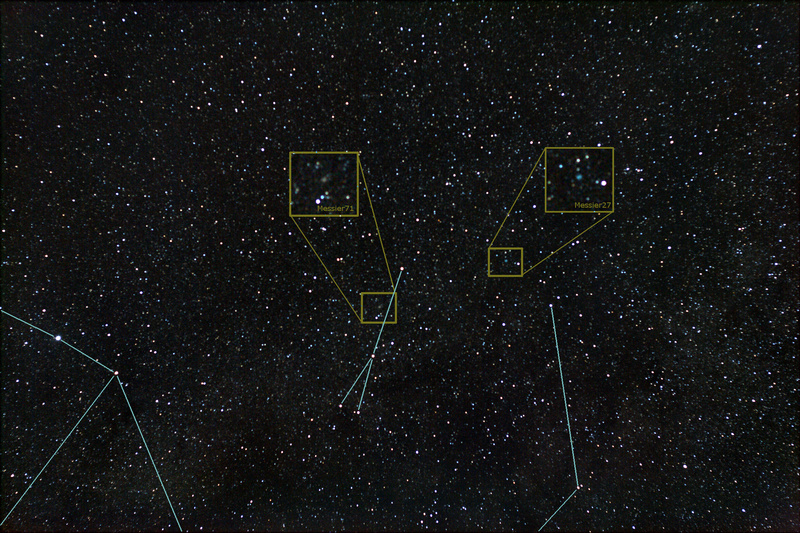 The three constellations from left to right are: Sagitta, Vulpecula and Cygnus (also know as Northern Cross). 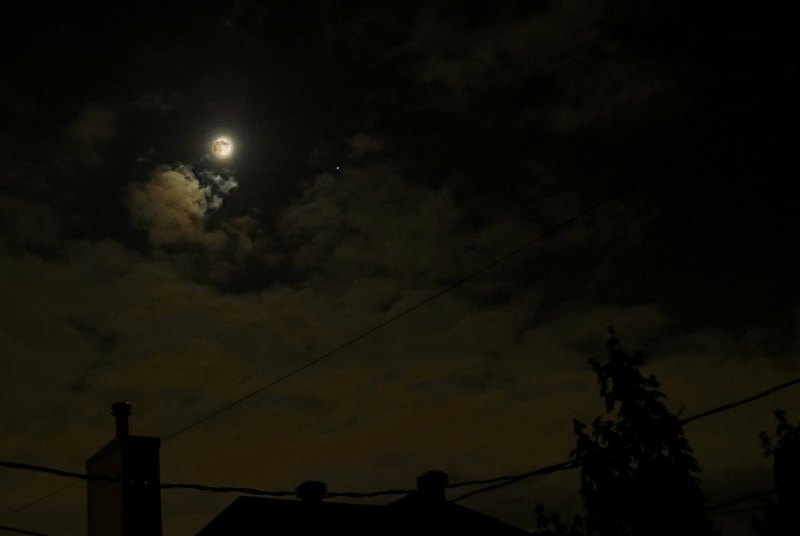 As a footnote, this was captured with nearly a full moon in a heavily light polluted suburb. At 30 seconds of exposure time, the luminosity peak was around 75%. The fall is a great time for wide-angle photography of the night sky. The Milky Way passes overhead which provides a chance to capture some dark nebula. Unfortunately after I had everything setup the 50mm Canon lens drifted out of focus; I only got about 2-3 frames with decent focus. By frame 14 of 60, it was too out of focus to even register (align) with software. When set to manual focus that lens is way too loose. But I managed to capture a hint of my first dark nebula at the bottom half of the image. Those immense molecular clouds that block out the background stars. In the following millions of years, these clouds will collapse to create start nurseries and new solar systems. Globular cluster Messier 71 and planetary nebula Messier 27 are identified in my image around the constellation Sagitta. I’m surprised at how “bright” and blue that nebula turned out. Constellations Orion and Taurus above the landscape.